Business blogging is not just about getting organic traffic for the primary website. It also involves giving a launching platform for a new product to make it easily reach followers and subscribers. Today, we're going to take a look at the step-by-step process of launching a product through a business blog. It's not as simple as publishing a product launch declaration post. The launching process involves several well-structured steps which are executed in a definite chronological order. If followed correctly, these steps can get more eyeballs for your new product despite having a low following on the blog. It doesn't matter if the product is digital or tangible, the launch process is more or less the same for both the types. You can definitely track, analyze, and refine the product launching process described below to come up with a better version that fits your exact business needs. To get the best results, do not hesitate in investing in some of the best premium solutions which may aid in completing the launch process—professionally. In business terms, a successful product launch is determined by the increase in pre-launch orders even before the product is released and spike in sales soon after the product is launched. You can relate this phenomenon to a typical iPhone launch process used by Apple. So, let's see how we can ensure that our brand-new product does not wait for weeks for the first order long after it's launched on our blog. The steps mentioned here are more tactical than technical so that everyone can implement them with ease. 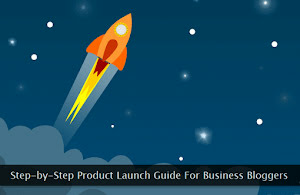 One of the common mistakes businesses make while launching a product on their business blogs is to directly write the launch post without any kind of prior announcement. The most common excuse to follow this approach is to keep the competitors in dark about the product's features. Really? In today's cut-throat competition, your competitors will come out with similar features in no time no matter when you public the details of the forthcoming product. A better strategy is to create hype about your product, long before it is released. Depending on the volume of potential buyers and the product itself, the teaser campaign can be started from six to one month before the product launch. The more anxious potential buyers are about the product, the more successful will be your launch. Here are two essential components for your teaser campaign. You can either include both these components or can opt for one of them. If you're selecting one of them, I'll strongly advise you to go ahead with the teaser posts. Coming Soon page - Clever marketers use this page for two different purposes. Firstly, it is used to showcase the features of the upcoming product, and secondly, it is also used to build an email list of the anxious potential buyers. This way, you're not only building anticipation but are also paving a way to easily spread the message to the potential buyers as soon as the product is launched. Teaser posts - If you're already delivering your posts to a decent number of RSS subscribers, it's a powerful medium in your hand to build anticipation for the upcoming product. Choose a single day per week and gradually start revealing the features of the product in each of the teaser post. Whether you're revealing features of a product through a dedicated page or through regular teaser posts, you must take care of some common things to ensure a smooth and successful anticipation-building campaign. Following is the checklist that must be kept in your mind before you share a new feature of the upcoming product to the general public. Extensively use and showcase results of a feature through snapshots, teaser video or through an infographic. Compare features with previous versions, if applicable. Always conclude with how a specific feature will address a specific problem. Talk about the next teaser post with some vague hints about its content. Remember, do not exaggerate things while revealing information about your product. You must also be cautious about the duration of the entire campaign. Too long duration can frustrate the readers and too short duration can reduce the number of potential customers you may reach in a given time. As soon as your product's beta version is ready, make a list of all the influencers in your niche and send the product to them. This is one of the potent weapons in your arsenal that will help you spread the word about your upcoming product in an effective way. Even if one of the influencers decides to talk about your product with his followers, your entire exercise of sharing the beta version with the leaders will pay off. While sending the beta version, never ask them to share it with their readers. Let them decide on their own if they want to share your product with their followers or not. Sending emails to influential people is an art. If you do it the wrong way, it may land in their trash can. Here's an excellent guide to email successful people and how to get responses from them. Once you've sent the beta version to the leaders in your niche, hop on to the next stage of follow up. Generally, you should wait at least a week before you even attempt to start a follow-up campaign. The bigger the name, the longer is the wait! I'll strongly suggest you send only one follow up email and that too short, simple, and straight to the point. And last but not the least, if you find an influencer talking about the beta version and sending a surge of traffic towards your blog; do not forget to send him the release version for free as well. This is a killer technique to create a never-ending flow of prospects coming through influential people. As soon as your anticipation-building campaign comes to an end, write a dedicated post announcing the additional bonus/features/gifts/goodies first 10 or 20 (or whatever you feel is the right number) customers will get without paying anything extra. Do not publish this post just before the product launch. Keep a one-week buffer period between the launch date and the bonus announcement post. This way, you and your network will have enough time to spread the word about the announced benefits. Use a tabulated checklist of benefits or goodies in this post to emphasize the same. This methodology is known to convert very well as an average reader tends to consume it easily rather than picking things from long text paragraphs. Following things must be kept in mind while writing such kind of post. Do not disclose the detailed price structure. Use this post to announce the actual product launch date. Do include the value/price of free goodies customers will get. If possible, include a dynamic counter showing the number of customers left, who can claim the additional benefits for free. Do not forget to emphasize that it is a one-time offer. The entire layout, structure, and content of this post govern how successful will be your offer for the potential customers. The more time you spend in spicing up this post, the more leads you will get. While launching your product, instead of just feeding the product launch blog post to your regular blog email list, create a separate list too with a custom newsletter featuring the new product. Utilize both the channels (regular blog post & a custom newsletter) to push the product launch details to the maximum possible readers. But, should we publish both of them at the same time? It's a capital mistake to push your newsletter on the same day you're publishing the product launch post on your blog. The reason is quite simple. A good percentage of RSS subscribers are also the part of the newsletter email list on a typical blog. Delivering both post and newsletter with almost similar content in their inbox on the same day is only going to trigger annoyance due to redundancy. This may backfire instead of giving you any kind of benefits. Send your newsletter anywhere between 2 to 7 days after the product launch blog post. Also, ensure that your newsletter layout and content arrangement is quite different from the launch post email. This will help you push the product details twice in a completely different way to your feed subscribers as well as to your newsletter email list. Prospects always look for credible data before they make their mind in favor of a product. Real customer testimonials and their case studies are some of the best ways to present that credible and trustworthy data in front of your readers. As soon as the product reaches your customers' hands, shortlist some of the loyal subscribers and people on your email list to share their experiences with you. There's no harm offering them an incentive for the same. Collect as much data as you can from each of the customers who are sharing the product's advantages with you. Following things must be kept in mind while publishing a testimonial post on your blog. Explain how a customer was able to solve a specific problem through your product. If possible, include photo of the customer. Include quotes from the customer. Share statistical data in a tabular format, if applicable. Fix one day in a week to share customers' testimonials on your blog. Do not forget to provide the correct details of the customer as well. Providing vague details about the customer is only going to nullify the effect of a good testimonial post. You can also send a short survey to the existing customers and can share the results in a separate blog post showcasing the usage trends for your new product. Along with the testimonials, you can also publish a special post announcing a contest and an associated prize that includes few product giveaways for the winners. This is the best way to further spread the word about your product through the blog. You must share this post on popular social media platforms as well to expand the reach and visibility. Through your contest post, you can get another chance to capture emails of the participants. This email list can be used to send custom newsletters featuring your product benefits in different ways. Keep the contest duration extended and continuously update the contest post with the details about the progress. This will give both you and the participants' ample time to share the post with as many contacts as possible. No matter what you're trying to sell through your blog, support and guidance is an integral part of the entire process. Whenever you come up with new help manuals and tutorials for your product, share them within your regular blog posts to keep the users updated about the same. Include usage best practices with examples from current customers. While writing these posts, generously link to the testimonials as well as to the product squeeze pages on the blog. This will help you divert potential customers to the key landing pages showcasing the features and benefits of your product. Create parent-child categories for these posts so that visitors can easily browse these product tutorials. Using hierarchical categories can also help you pull the right child tutorial post for the reader depending on the parent tutorial post he is reading at a given time. Right from the launch day, include custom banners and creatives in your blog's sidebar and optionally in the footer to give entire inbound traffic a chance to know more about your product. Link these banners with your key landing pages that describe your product's features in detail. You can also use custom floating top and bottom bars to divert visitors towards optimized squeeze pages to get more leads. Use these linked floating bars to describe the benefits of your product. Frequently change the featured content within these sections to cover all the features offered by your product. Experiment with their placements and layout. Collect data associated with each step discussed above and optimize it for your next product launch. Business blogs are often ignored in the product launch cycle. It's up to you how you leverage this powerful medium to boost the sales of your new product. The key here is to continuously update your blog in such a way that your readers get to know more about your product and its benefit.